Every once in a while, I come across a product that is so clever or interesting I can't wait to tell about it. FM Sounds: The World's Smallest FM Radio is just such a device. I first saw one at a product announcement party. I noticed a group of five or six colleagues examining something. In the center of the group was a guy holding out his right hand. Nearly lost in the center of his average0size palm was a tiny black rectangle. "What's that?" I asked. "An FM radio: was the response. 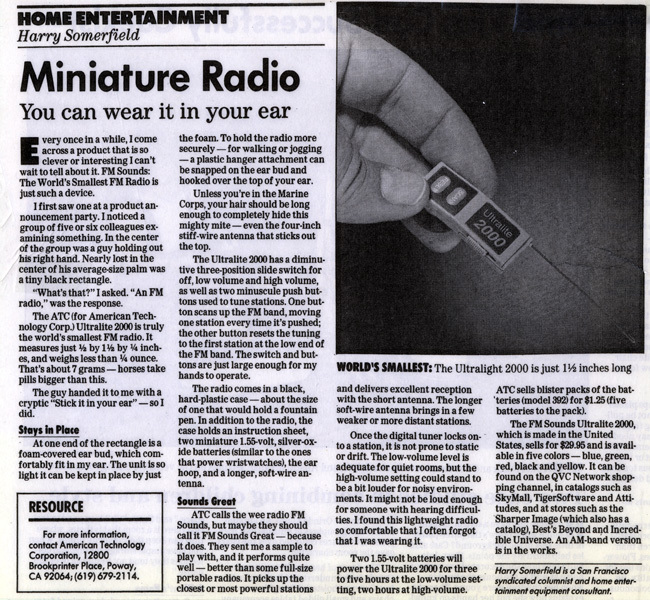 The ATC (for American Technology Corp.) Ultralite 2000 is truly the world's smallest FM radio. It measures just 1/2 by 1 1/2 by 1/4 inches, and weighs less than 1/4 ounce. That's about 7 grams--horses take pills bigger than this. The guy handed it to me with a cryptic "Stick it in your ear"--so I did. At one end of the rectangle is a foam-covered ear bud, which comfortably fit in my ear. The unit is so light it can be kept in place by just the foam. To hold the radio more securely--for walking or jogging--a plastic hanger attachment can be snapped on the ear bud and hooked over the top of your ear. Unless you're in the Marine Corps, your hair should be long enough to completely hide this mighty mite--even the four-inch stiff-wire antenna that sticks out the top. The Ultralite 2000 has a diminutive three-position slide switch for off, low volume and high volume, as well as two miniscule push buttons used to tune stations. One button scans up the FM band, moving one station every time it's pushed; the other button resets the tuning to the first station at the low end of the FM band. The switch and buttons are just large enough for my hands to operate. The radio comes in a black, hard-plastic case--about the size of one that would hold a fountain pen. In addition to the radio, the case holds an instruction sheet, two miniature 1.55-volt, silver-oxide batteries (similar to the ones that power wristwatches), the ear hoop, and a longer, soft-wire antenna. ATC calls the wee radio FM Sounds, but maybe they should call it FM Sounds Great--because it does. They sent me a sample to play with, and it performs quite well--better than some full-size portable radios. It picks up the closest or most powerful stations and delivers excellent reception with the short antenna. The longer soft-wire antenna brings in a few weaker or more distant stations. Once the digital tuner locks onto a station, it is not prone to static or drift. The low-volume level is adequate for quiet rooms, but the high-volume setting could stand to be a bit louder for noisy environments. It might not be loud enough for someone with hearing difficulties. I found this lightweight radio so comfortable that I often forgot that I was wearing it. Two 1.55-volt batteries will power the Ultralite 2000 for three to five hours at the low-volume setting, two hours at high-volume. ATC sells blister packs of the batteries (model 392) fpr $1.25 (five batteries to the pack). The FM Sounds Ultralite 2000, which is made in the United States, sells for $29.95 and is available in five colors--blue, green, red, black and yellow. It can be found on the QVC Network shopping channel, in catalogs such as SkyMall, TigerSoftware and Attitudes, and at stores such as the Sharper Image(which also has a catalog), Best's Beyond and Incredible Universe. An AM-band version is in the works. 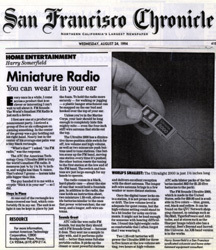 Harry Somerfield is a San Francisco syndicated columnist and home entertainment equipment consultant.